Few men, and even fewer entertainers, have impacted world events like the Colwell Brothers and Herb Allen. They played to cheering audiences across the globe, from intimate gatherings in the huts of remote villages to rock-star scale crowds at concert halls in great metropolises. They thrilled 90 million television viewers with their groundbreaking Up with People halftime spectacular at Super Bowl X. They met and performed for presidents, kings and prime ministers as well as everyday people in 60 countries on 6 continents. Their songs entertained, and challenged listeners to think, to see, to stand and make things better. Or sometimes, their music simply served to put things into perspective and help people laugh. They made it look easy to write songs on the road, rehearse them on the fly, and sing them in dialects and languages they had barely heard before. They never complained, though it took sacrifice, determination, and, most of all, courage. They literally walked away from their childhoods, comfort, careers and loved ones. They put it all on the line for something they believed. What they believed was that they could change the world. 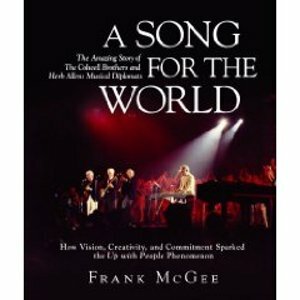 A Song for the World is the inside story, an up close and personal view of how they made things happen. It takes you around the planet and through half a century of historic, world shaping events that felt their influence. Through it all, the Colwell Brothers and Herb Allen relentlessly pursued the purpose of humanity. Their dedication and dreams touched the heart of a planet, set it beating to the rhythm of their music, and started its people marching to a greater vision of possibility. Such is the power of their music.